Cut tofu in half vertically then horizontally. Drain on several layers of paper towels to remove as much liquid as possible. 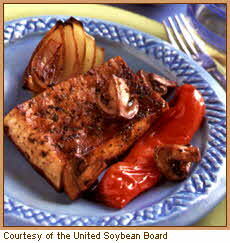 If desired, score surfaces to allow more marinade to penetrate tofu. Place tofu and vegetables in a shallow baking pan leaving enough space between the pieces for even roasting; brush with vinegar mixture. Let stand 30 minutes, brush again and let stand 30 minutes longer. Turn once halfway through baking time. Add mushrooms during last half of roasting time. Transfer to platter and sprinkle with parsley. 38 Cal., 9.5 g pro., 15.5 g carb., 4.6 g fat, (29% Cal. from fat), 0.5 g sat. fat, 0 mg chol., 1.3 g fiber, 367 mg sodium, 8.4 g pro. from soy, 2.2 g fat from soy. This recipe meet the requirements of the FDA's health claim on soy protein, which states "25 grams of soy protein a day, as part of a diet low in saturated fat and cholesterol, may reduce the risk of heart disease." Foods that meet the health claim must contain 6.25 grams of soy protein and be low in fat, saturated fat and cholesterol.